All puppies nip or bite at your hands, fingers, toes, feet, and ankles. But there’s one big reason that you should not allow this behavior anymore. Since there should never be any question that YOU are the Alpha dog, from this day forward you must never allow a puppy to nibble or bite at your hands (or feet). Use your thumb and forefinger to roll the puppy’s top lips under his teeth so that he bites down on them. The puppy will whimper after he’s bit his lip. At the same time, you should adamantly say “NO!”. The trick is consistency. From this point forward, you should never let your puppy mouth on peoples’ hands or nip at any other person from now on. It won’t take long before puppy gets the message. 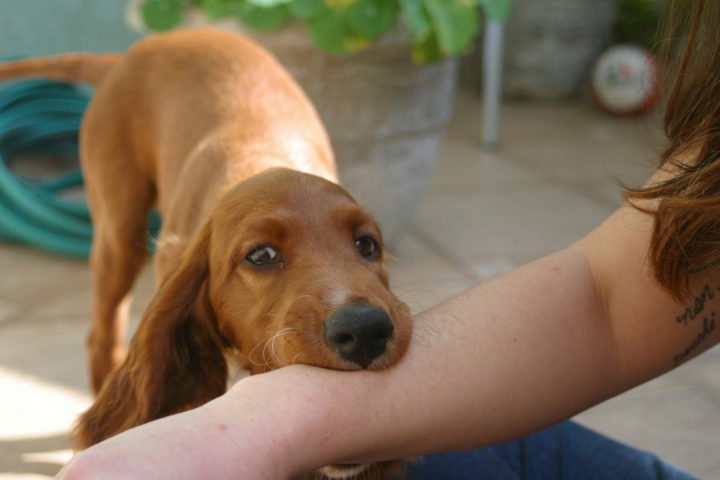 Stop your puppy from nipping by covering your hand with peanut butter and letting it lick it off. This trains it to associate licking with the hand, not nipping. Never hit the dog’s nose or mouth.